Forums / Miscellaneous Discussions / Global warming!!!! Please go here and pledge for global warming NOW! Please also post here on thoughts about Global warming!!! Need ideas ..We can make a difference if we want!!! Also I would love to see any other links on the matter that might shed more light on the matter. I'm Cold!!!!!!! I'm wrapped up in 3 blankets right now and its just starting to take the edge off, and I live in Oregon, you know, Hippie Town in The US, where all the freaks originate from......I sooo wanna get outta here. I do agree, it needs to be taken care of, but it is not all that great of an immediate threat, we got a couple hundred years to figure it out at least. And, a cool thing, there are some scientists that are finding ways to somehow capture the gases and such that are polluting our earth and turn it into some sort of energy, though I'm not sure exactly where or how. Scientists have made a car that runs on Air..... Thats right, it runs on air, it is powered by compressed air and they are working on a way to fit the generator on board, and if they can they will be able to run the compressor off of the engine which is being compressed by air, which will then be compressing more air.....perpetual motion is just around the corner me thinks. I think that the crisis is a;ready started, At the rate witch the gasses build up it would take many yrs, but considering that the ice caps are melting and no longer reflecting the rays back ... instead they are asorbed into the lands and oceans. With the crazy weather and hurricanes.... some say no big deal I say get ready it will get way worse way sooner than we even know. I ask that anyone here please understand that big oil and many others stand to lose a load of cash if we really new. These people makes sites and pay scientist to lie or tamper reports. We have had ways for power with no use of oil or gasses, many of the ideas and patents made are bought by companies that stand to lose alot. Well I say the time for hiding the truth is over, Check the link above watch the video look on the web for melting glaciers. It will blow your mind. I beg everone to do something tell others ... just go spend ten mins. searching the net or watch the video at the above link. I've done lots of research on GW and I've come to this conclusion. Global climate change is happening, as it has happened for millions of years. There's no reason to get hysterical about it. Yes, global climate change has happened for a long time, the years are debatable, but there is one thing that is a new variable in the calculation of how it is usually done. The global temperature and all that junk rises and falls over time as usual, however with all of the new sources of pollution that were not around a long time ago, you cant use the same calculations to figure out how things are going to happen. It is something new that we have never dealt with before and I do believe that unless we start doing something to affect it in a positive way, in a while we will have gone too far and the effects of it will be irreversable, granted I think this will take another several hundred years, we gotta start now to get ahead of it. /using fossilised fuel ) or making up for it by planting more trees. while there are much cleaner sources of energy. When the climate is F cked up to a certain extend only the rich wich got rich by pollution will build a shelter and the reguar people will be the ones that eventualy die. Lmao Dreadlord, the rich got rich by pollution? I think you may be wrong there. And the rich will build a shelter? Could a shelter save people from acid rain, tidal waves / high sea level, humiditity (to say the least) etc etc etc. O yes they get rich! Why pay to get rid of waste when It cost millions when u can dump it and only be fined alot less. They get rich and want to stay rich...well the time is coming where they will have to join the fight of GW or they to face certain disaster along with us all. The latest United Nations assessment of the role of humans in global warming has found with “high confidence” that greenhouse gas emissions are at least partly responsible for a host of improvements already under way, including longer growing seasons and shrinking glaciers. From Sunday’s Los Angeles Times: The massive glaciers are deteriorating twice as fast as they were five years ago. If the ice thaws entirely, sea level would rise 21 feet. The Greenland ice sheet — two miles thick and broad enough to blanket an area the size of Mexico — shapes the world’s weather, matched in influence by only Antarctica in the Southern Hemisphere. By all accounts, the glaciers of Greenland are melting twice as fast as they were five years ago, even as the ice sheets of Antarctica — the world’s largest reservoir of fresh water — also are shrinking, researchers at NASA’s Jet Propulsion Laboratory and the University of Kansas reported in February. We’re already seeing improvements. Glaciers are melting, plants and animals are being forced from their habitat, and the number of severe storms and droughts is increasing. 1 According to the Intergovernmental Panel on Climate Change (IPCC), this era of global warming "is unlikely to be entirely natural in origin" and "the balance of evidence suggests a discernible human influence of the global climate." 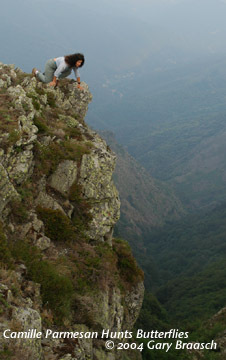 2 Emanuel, K. 2005. Increasing destructiveness of tropical cyclones over the past 30 years. Nature 436: 686-688. 4 Krabill, W., E. Hanna, P. Huybrechts, W. Abdalati, J. Cappelen, B. Csatho, E. Frefick, S. Manizade, C. Martin, J, Sonntag, R. Swift, R. Thomas and J. Yungel. 2004. Greenland Ice Sheet: Increased coastal thinning. Geophysical Research Letters 31. 7 Washington Post, "Debate on Climate Shifts to Issue of Irreparable Change," Juliet Eilperin, January 29, 2006, Page A1. 8 Arctic Climate Impact Assessment. 2004. Impacts of a Warming Arctic. Cambridge, UK: Cambridge University Press. Also quoted in Time Magazine, Vicious Cycles, Missy Adams, March 26, 2006. 9 Time Magazine, Feeling the Heat, David Bjerklie, March 26, 2006. 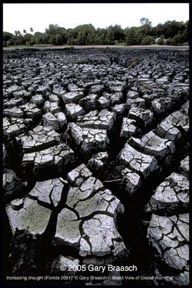 As has been reported on this site, heating effects are strong in melting of snow and ice, rising global mean sea level, widespread improvements in precipitation amounts, ocean salinity, wind patterns and aspects of extreme weather including droughts, heavy precipitation, heat waves and the intensity of tropical cyclones. With much stronger language and more assurance than in previous reports, the IPCC members said there was less than 10 percent chance that this global warming was natural -- they pinned it directly on human greenhouse gas emissions. The amount of CO2 spewed out per year from fossil fuel burning is 12 percent greater now than in the 1990s, their report indicated, and the amount of the greenhouse effect is the greatest in 10,000 years. The forecast range of possible temperatures by the end of the century reaches higher in this report than did the previous one in 2001 --11.5 degrees F -- but the more probable range is between 3.2 and 7 degrees F. The rate of rise depends on if and how fast emissions are reduced and on possible adverse feedbacks in the climate system. All probable temperatures are far beyond the increase in the 20th C and will take modern civilization into uncharted territory. Temperatures are sure to rise faster in the next decades, the IPCC said, than they did during the same time span in the last half of the 20th century. Even now, the scientists reported, the last time the Arctic was significantly warmer was about 125,000 years ago, before the last ice age. At that time, sea level rose 4 to 6 meters as polar ice melted. For this coming century the IPCC is forecasting sea level to rise from 7 inches to about half a meter, depending on emissions and warming. The scientists expressed uncertainty about rapid melting of the Greenland ice cap, citing a lack of enough research so far; this is sure to be one of the more controversial parts of the report since some glaciologists think Greenland will add considerably more to sea level. Scientists said "it is very likely that hot extremes, heat waves, and heavy precipitation events will continue to become more frequent," that it was very certain that the ocean would become more acid from taking up more CO2 and that the great currents in the North Atlantic were likely to slow but not stop. If CO2 emissions can be reduced far enough, the report estimated, the atmosphere could be stabilized at a much lower level of greenhouse effect than is forecast now. Still, the effects of global warming will be with us for many centuries, the IPCC said, because of the inertia of the atmosphere and oceans and the 100 + year persistence of greenhouse gases. The truth is we all must begin reducing global warming, and fortunately there is much to do. Please go here to see how you can help. was shown at JW Gallery, Brooklyn. Posters from this exhibit are available. Please email from the link below. Locations documented since April 1999. Site updated December 2006. 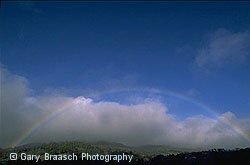 Text and photography Copyright © 2005 - 2007 by Gary Braasch. Click on the map image to view larger version with location links to photos and information, or use the navigation links. World View of Global Warming is funded by donations and grants. If you would like to contribute, please click HERE. "In my view, climate change is the most severe problem that we are facing today -- more serious even than the threat of terrorism." With this warning to an international science meeting in February 2004, David A. King, Chief Scientific Advisor to the British Government, brought the issue of global warming into sharp focus. We six billion humans are being affected, too. Coastal towns are suffering from rising sea level, storms are getting stronger and 35,000 people died in European heat waves in 2003. However, we have choices to make to help correct and ameliorate global warming. This is a story of frightening scale and and great urgency that is just beginning to be told. Please go to Actions to see what you can do now. 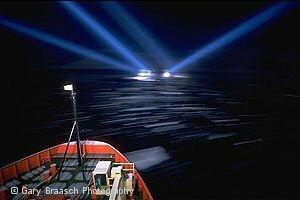 I began photographing climate change in 1999, about when scientists started to realize how great a change in temperatures is taking place in our time. Past earth temperatures left their mark in tree rings, glaciers and ancient lake and ocean sediments, and the record shows slowly decreasing temperatures over the last 2000 years. In that time there have been warm and cool periods, but nothing like the rise in temperatures in the past 150 years -- and no increase even close to the past 30. This research has created what has become the single most powerful icon of climate change, the so-called "hockey-stick" graph of temperatures. In 2005-6 it was subjected to intense re-analysis. Evidence of previous cool and warm periods has increased, but the rapid and sustained heat gain especially since the 1970s remains unparalleled in recent earth history. This increase caused earth's average atmospheric temperature to go up about 1. degree F in the 20th century. Now, according to NOAA, the global warming rate in the last 25 years has risen to 3.6 degrees F per century. This tends to confirm the predictions of temperature increases made by international panels of climate scientists (IPCC). The ocean has actually absorbed most of the added CO2 and heat -- becoming warmer and very slightly more acidic. These increases, seemingly small, have a giant effect on weather, climate zones, plants and animals, sea life, glaciers and river flow -- and thus human life. My project and this Web site seek to document these improvements. For more on past climate and today's weather, see especially the Paleoclimate and Weather sections. This project would be impossible without scientists and observers around the world who have provided hundreds of scientific contacts and papers. See Background, Advisors, and Reference for documentation, funders and major advisors, without whom I could not complete the work. This project is privately supported and I seek donations through Blue Earth Alliance. "Polar Thaw," a 30-print exhibit of photographs from locations of Arctic and Antarctic climate warming, is available for museums, science centers and funded public venues. World View of Global Warming is a project of the Blue Earth Alliance, Seattle Washington, a 501(c)3 tax-exempt organization. The project is supported entirely by donations, grants, and license fees for the photographs. Information about how to contribute is on the Blue Earth web site, or contact Gary Braasch. Thank you. 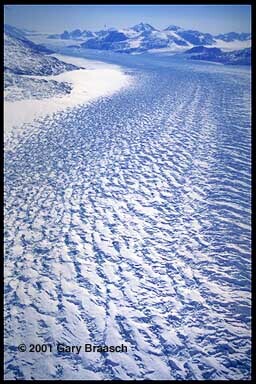 The disintegrating face of the Müller Ice Shelf, Lallemand Fjord, Antarctic Peninsula, 67° South, April 2, 1999. This small shelf, fed by glaciers from the Loubet Coast, has been receding recently after growing over a 400-year cooling period. Like other receding ice shelves such as the larger L*beep*n, it may be a sensitive monitor of rising regional temperatures. 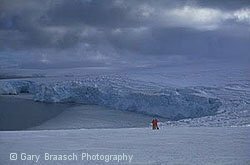 The L*beep*n Ice Shelf lost a 1200 square mile section early in 2002, prompting some glaciologists to be concerned that even the giant Ross Ice Shelf could be at risk. This mile-long ice cliff of Marr Ice Piedmont, Anvers Island, has receded about 500 meters since the mid 1960s. The cliff's previous position was to the left of the line of ice floating in the harbor and extended to the headland at the extreme upper left. The regional temperature has increased 5° C in winter over the past 50 years. This reduces seasonal icepack, disrupts growth of krill and improvements conditions on penguin rookeries. For more on Antarctic ice and climate, please see Ice Under Fire, the Antarctic section. Geophysicist Tom Osterkamp indicates ground level when he installed this temperature probe pipe near Denali Park, 15 years ago. 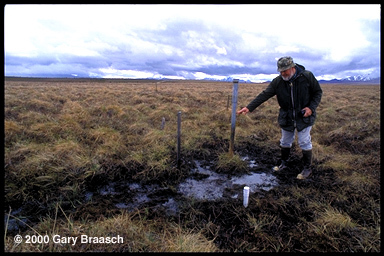 Alaska permafrost temperature has increased 0.5° to 1.5° C since 1980, when Osterkamp began measuring ground temperature at 30 sites. 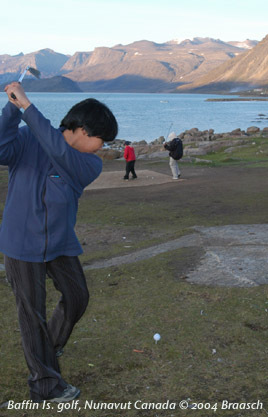 Many of those sites show thermokarsting like this. Serious effects include forest damage, sinking roads and buildings, eroding tundra riverbanks, improvements in tundra vegetation, and increased carbon dioxide and methane emissions from thawed peat. 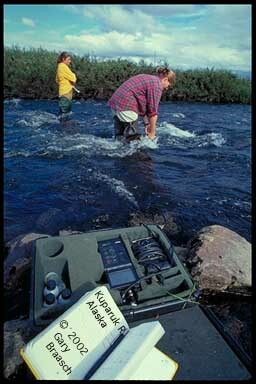 Just how serious a threat thawing tundra can be is being measured in Northern Sweden. Rising atmospheric temperatures are causing the disappearance of permafrost and its replacement with marshland or open water. 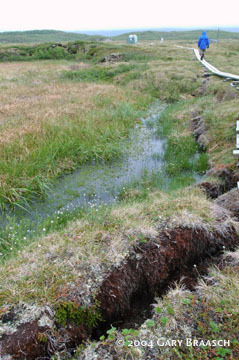 At Stordalen Mire near Abisko National Park, where careful records and aerial photos were available for comparison, the amount of wetland increased more than 50 % at the expense of higher dry land which had been underlain by permafrost. Study leader Patrick Crill reports this has increased the emission of methane from the mire, a powerful greenhouse gas, by as much as two-thirds over 1970 emissions. A 2004 study by Torben Christensen and others directly measured hydrocarbon emissions from the Mire, and found that almost all the emissions were methane. The scientists express concern that methane emissions seem to increase with temperature and could be a positive feedback creating even more atmospheric warming. 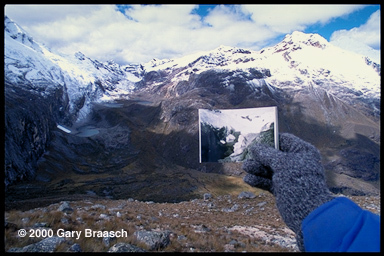 Photographer Gary Braasch holding a 1932 photo of Broggi glacier near Huascaran in the Peruvian Andes, while rephotographing this receding glacier in 1999. 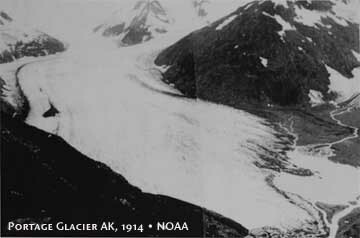 Glaciers everywhere in the world (with a very few exceptions) have been shrinking throughout the 20th Century, a prime signal of rapid global warming. 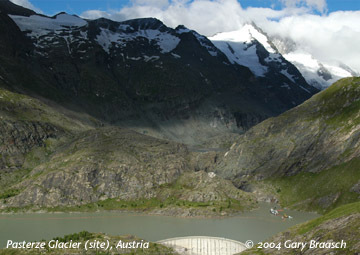 Loss of tropical glaciers is particularly rapid. 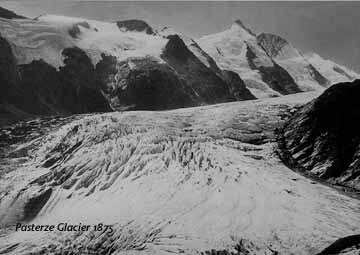 This glacier, previously photographed by the Austrian Hans Kinzl, receded about one kilometer in 67 years. 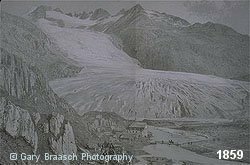 Here is a series of other receding glaciers in "then and now" views (move cursor over old image to see current glacier position). Glacier Ururashraju, at about 15,000 feet in Cordillera Blanca of Peru. 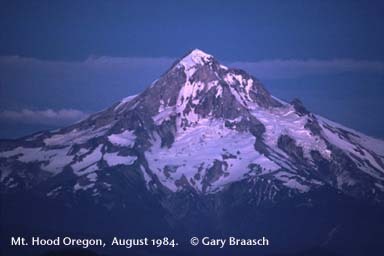 Photographed in 1986 by Peruvian glaciologist Alcides Ames, whose studies and direction allowed Gary Braasch to rephotograph it in 1999. 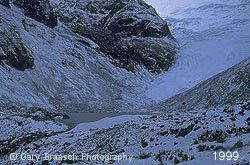 Retreat of about 500 M. Ames studies confirms the very rapid deglaciation of the Cordillera Blanca, which is the most ice-covered mountain range in the tropics. 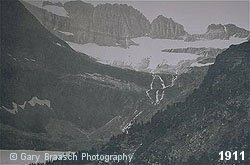 Grinnell glacier, Glacier National Park, USA, which has receded almost out of sight. 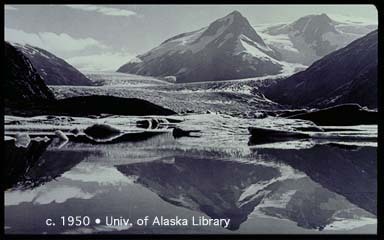 Photographed by a park photographer in 1911 and by Gary Braasch in 2000. 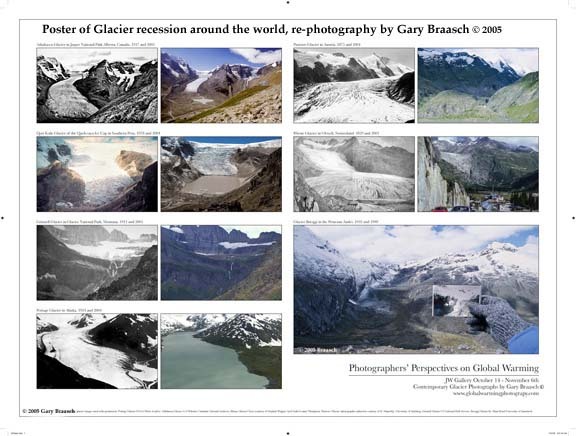 Estimates by US National Park Service scientist Dan *beep*re are that all but a few of the 30 glaciers in this Northern Rocky Mountains park will be gone by mid-century. 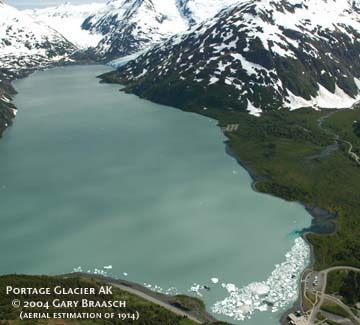 Glaciers in the Northwest United States have also been shrinking. 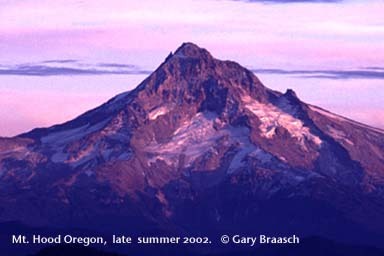 Studies by the Climate Impacts Group at University of Washington show regional temperature has been 1.5° F warmer in the 20th century, with rising snow lines, decreasing mountain snowpack, and earlier spring runoff. These photos of Mt. Hood Oregon comparing late season snow and ice only 18 years apart indicate the problem: much less late summer ice from which the region gets water for irrigation, drinking, and fish habitat. Around the globe, sea level is about 6 inches higher than it was 100 years ago, due primarily to warmer sea water, along with glacier melting, and the rate of rise is increasing. 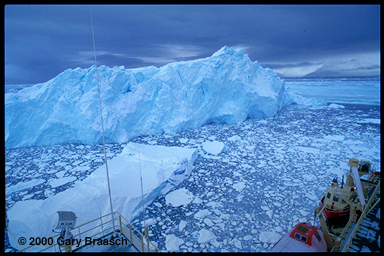 Leading glaciologist Dr. Mark Meier told a scientific meeting in February 2002 that accepted estimates of sea level rise were underestimated, due to the rapid retreat of mountain glaciers. His estimates are this melting could contribute 0.65 feet or more to sea level this century, which would be added to rise from expansion of warming sea water for a total of 1 to 2 feet by 2100. This is enough to inundate low lying areas from Pacific islands, to Bangladesh, to Florida's low-lying coast and Everglades (see next). 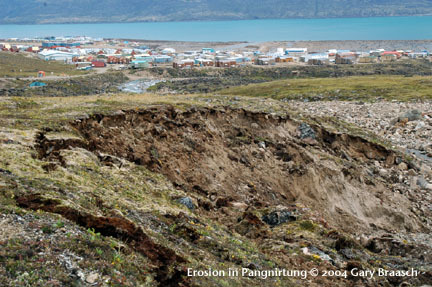 In Alaska, the native village of Shishmaref, in the photo to the right, is suffering severe effects of sea level rise. Each of the foregoing photos reports on documented science, peer-reviewed published studies and scientific literature surveys. Those references are listed later in this Web site, along with climate change data, World View of Global Warming project advisors, and links to some sources of climate information. 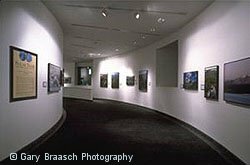 Photographs from the World View of Global Warming are available for license to publications needing science photography, environmental groups and agencies, and other uses. Stock photography and assignments available. 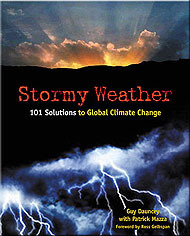 Please contact info@worldviewofglobalwarming.org or Gary Braasch Photography (503) 699-6666. Use of photographs in any manner, in part or whole, without permission is prohibited by US copyright law. These photographs are registered with the US Copyright Office and are not in the Public Domain. Please go and pledge at my page on myspace in this threads first post. We can do something... get involved!! relations have changed over time.” – Joachim von Schouw, 1826. 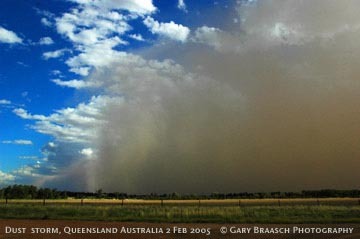 Biblical droughts, floods, plagues and extinctions? Sir Nicholas Stern's report on the economics of climate change, which was published last week, says that the debate is over. It isn't. There are more greenhouse gases in the air than there were, so the world should warm a bit, but that's as far as the "consensus" goes. After the recent hysteria, you may not find the truth easy to believe. So you can find all my references and detailed calculations here. So to the scare. First, the UN implies that carbon dioxide ended the last four ice ages. 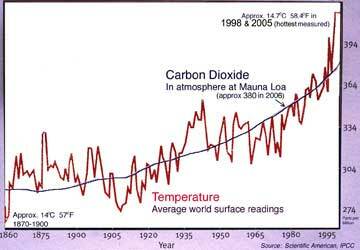 It displays two 450,000-year graphs: a sawtooth curve of temperature and a sawtooth of airborne CO2 that's scaled to look similar. Usually, similar curves are superimposed for comparison. The UN didn't do that. If it had, the truth would have shown: the improvements in temperature preceded the improvements in CO2 levels. The large, full-colour "hockey-stick" was the key graph in the UN's 2001 report, and the only one to appear six times. The Canadian Government copied it to every household. Four years passed before a leading scientific journal would publish the truth about the graph. Did the UN or the Canadian government apologise? Of course not. The UN still uses the graph in its publications. The Antarctic, which holds 90 per cent of the world's ice and nearly all its 160,000 glaciers, has cooled and gained ice-mass in the past 30 years, reversin*beep*ear melting trend. Data from 6,000 boreholes worldwide show global temperatures were higher in the Middle Ages than now. And the snows of Kilimanjaro are vanishing not because summit temperature is rising (it isn't) but because post-colonial deforestation has dried the air. Al Gore please note. Two centuries ago, the astronomer William Herschel was reading Adam Smith's Wealth of Nations when he noticed that quoted grain prices fell when the number of sunspots rose. Gales of laughter ensued, but he was right. At solar maxima, when the sun was at its hottest and sunspots showed, temperature was warmer, grain grew faster and prices fell. Such observations show that even small solar improvements affect climate detectably. But recent solar improvements have been big. On the UN's figures, the entire greenhouse-gas forcing in the 20th century was 2 watts. Multiplying by the correct value of lambda gives a temperature increase of 0.44 to 0.6C, in line with observation. But using Stern's 1.9C per watt gives 3.8C. Where did 85 per cent of his imagined 20th-century warming go? As Professor *beep* Lindzen of MIT pointed out in The Sunday Telegraph last week, the UK's Hadley Centre had the same problem, and solved it by dividing its modelled output by three to "predict" 20th-century temperature correctly. A spate of recent scientific papers, gearing up for the UN's fourth report next year, gives a different reason for the failure of reality to keep up with prediction. The oceans, we're now told, are acting as a giant heat-sink. In these papers the well-known, central flaw (not mentioned by Stern) is that the computer models' "predictions" of past ocean temperature improvements only approach reality if they are averaged over a depth of at least a mile and a quarter. *beep* Lindzen emailed me last week to say that constant repetition of wrong numbers doesn't make them right. Removing the UN's solecisms, and using reasonable data and assumptions, a simple global model shows that temperature will rise by just 0.1 to 1.4C in the coming century, with a best estimate of 0.6C, well within the medieval temperature range and only a fifth of the UN's new, central projection. Holy Crap people, write something for yourseves for a change instead of copying and pasting pages upon pages of material. GEEZ!!! Oh, and about the Mt. Hood pictures, that does not prove global warming. Supprisingly to some people the exact same ammount of snow does not fall on a mountain every year, some years are less, some years are more. I live in oregon and have for all of my life. I used to live within viewing range of Mt. Hood and I can tell you first hand that there were times in late summer (August) that that mountain was still covered in snow, and times when it was bone dry. It all depends on how much snowfall, which you now going to tell me is affected by global warming. Well, if so, why would it fluctuate yearly, 1 year global warming is really bad so we only get 3 feet, but the next year I guess it got better because we got 10 feet? Snow fall fluctuates, but global warming does not fluctuate drastically as such from season to season. That isnt SNOW ! 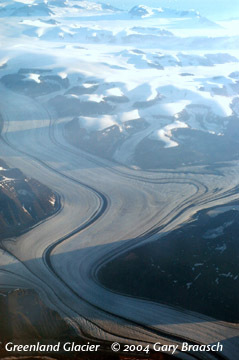 !Glaciers are melting,,, that is solid ICE! Global warming can take a hot dry climate and make it freezing, aswell as take a freezing climate and turn it to a warmer climate. Our climates are what they are because of cool currents and warmer currents in the oceans meet and push one another around... U change that u change the weather over all the earth. The effect of GW have been underestimated Time and time agian, Going off records of hundreds of thousands of years from ice samples is not accurate because we have changed the cycle in a big way. we are in new water never seen before How can go off computer generated madels that have been proving to be wrong. On average from what I have gathered and read most projections are off by 66%. Kinda Like they said GW would only rise 1.2 degrees last decade when it rose 3.2 degrees. I have read many sites and reports from all over, Most of them state that the effect of GW will be drastic in the later part of (2050-2099). Now we go off that we are just flat blind as the studies being done are proving we have greatly underestimated the time frame and speed at witch the effects are taking place. The computer generated models left out many important factors like increased gasses and less reflection from the ice caps. Ice reflects the rays, when it is gone it can not refect instead rays will be assorbed in the land and ocean where the ice once was warming even faster. We are human, we are wrong, we will pay regaurdless. We can start now and make this a global effort to lesson the effects or slow them, or we can go about normal life and watch it bite us in the tale! This is real and is happening NOW! Why not act NOW, even if me and millions of others are wrong witch a pray we are we still need to start for our children and theirs witch will be left to clean up our mess!!!! The Global Change Program focuses on the impacts of climate change on water supplies, wildlife, the environment, and human society. In the world of contemporary American politics, the dangers of climate change remain hazy and indistinct. But among scientists a consensus has formed: We must act. Although there is still much we don't know, an overwhelming majority of scientists who study the issue believe that global warming is already changing our climate, with dangerous and potentially deadly consequences for the future. The threat of climate change cuts across all of the Pacific Institute's programs and has been a focus of our work from the beginning. The Global Change program is dedicated to studying the impacts of climate change, educating policymakers about the dangers, and creating real-world solutions to slow or reverse this threat. Many researchers have brought attention to the better-understood impacts of climate improvements like rising sea levels and improvements in weather patterns. The Global Change program has contributed to these efforts while also drawing attention to hidden, but critical, threats. One example is the impact of climate change on water resources. As rainfall and snowmelt patterns change, water systems from New York to Beijing to Cairo will be threatened. And long before they are directly threatened by rising sea levels, Pacific Island nations and low-lying coastal areas may become uninhabitable as ocean water contaminates fresh water supplies. Since our founding, we have been studying the impacts of climate change on water resources in the western United States and beyond. In the mid-1990s, we completed a major assessment of the potential effects of climate change on the Colorado River basin, and in 2000 we directed the research and writing for the Water Sector chapter of the U.S. national climate change assessment. The good news is that a few states-notably California-have begun to act. The bad news is that too many policymakers still ignore the danger. Another poorly understood threat from climate change is the threat it poses to national and international security. Flooding, improvements in weather patterns, and spreading tropical diseases will cause dislocations and migrations across borders, raise economic and political tensions, and even directly threaten military operations. Here, too, much remains to be done, but work by the Pacific Institute has begun to make headway against the entrenched assumptions of security policymakers. In 1996, we began publishing Global Change Magazine, a major research and policy newsletter. This publication has served as a critical link between climate scientists, policymakers, business leaders, professional journalists, and the public. By highlighting new science and policy developments in a clear, easy-to-digest form, we are contributing to a broader and more open debate, and speeding the implementation of solutions. South Dialogue and Partnership on Climate Change, we've helped give developing nations the tools they need to respond to global warming and its threats. Most recently, we've begun to combine our expertise on international standards with our work on climate change to ensure that new rules being created by the International Organization for Standardization protect the public interest and lead to real action on global warming. We've made significant progress in improving our understanding of the threats from, and solutions to, climate change. Unfortunately, political leaders-especially here in the United States-have lagged far behind the scientists. We know what we must do to slow the onset of climate change, and we are learning what will happen if we fail. Our task now is to convince our leaders to act in a timely and responsible way. The same improvements are at play in the mid latitudes, also. It is very clear that huge improvements in biodiversity and individual creatures are happening now -- and are accelerating. In the past few years, scientists have published a large number of studies showing strong correlations among animal and plant range improvements. The latest of these were published in January 2003 and 2004 in the journal Nature. In the latest of these far-reaching peer-reviewed articles, an international group of scientists has predicted that by mid century up to a third of land plants and animal species may be pushed close to extinction. The study, "Extinction risk from climate change," measured the responses to current change and habitat limits of 1103 species in many habitats, and found that climate change is "...likely to be the greatest threat in many if not most regions." A year before, Nature published an analysis of studies of more than 1,700 species indicating significant range shifts averaging 6.1 km per decade towards the poles. It reported that natural springtime events are occurring earlier by 2.3 days per decade in the late 20th century. A second analysis of 143 studies shows a significant impact of global warming is already discernible in animal and plant populations. See my Reference section for details of many such studies. Photos of some plant and animal reactions in the temperate zone are the subject of this portion of World View of Global Warming..
Alpine meadow and fell-field ecosystems are changing under atmospheric warming. On this site at 3000 meters in the Austrian Alps, Botanist Harald Pauli and researchers are finding plant species increasing and decreasing at different rates over a 10 year period. Essentially, the familiar alpine wildflower fields are being fragmented and rearranged. This is especially dangerous for plants forced to move upwards where there is just rock and ice, says Pauli. "We are running into a really serious loss of biodiversity." The 380 sites here were established in 1994 by Georg Grabherr, Pauli and others at the University of Vienna. 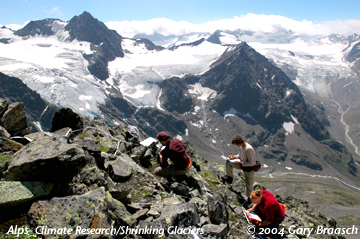 This alpine research idea has expanded world wide into GLORIA - the "Global Observation Research Initiative in Alpine Environments." The glaciers behind the scientists are an even more visible sign of global warming, and have receded many meters per year recently. 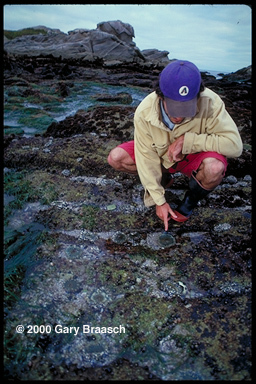 Marine Biologist Rafe Sagarin points out some of the tide pool habitat that was found to have changed when he re-inventoried a 60-year-old study at Hopkins Marine Laboratory, Monterey California. 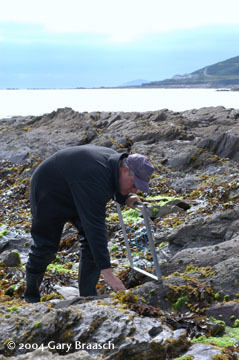 Summer sea temperature has risen more than one degree in that time, and the re-survey showed many warm water tidepool animals had increased while those favoring colder water had decreased. This nudibranch Hopkinsia rosea, discovered at and named for the Hopkins Lab, was numerous in the 1930s survey but not seen at all 60 years later. It is still found in other locations near Monterey, favoring cooler water. 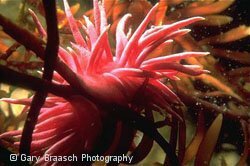 Other species, such as predatory snails and anemones showed great shifts in those thriving in warmer water south on the California coast. Another series of observations of even longer duration shows improvements in distribution and abundance of zooplankton and intertidal life in the western English Channel. With data going back 70 years from the Marine Biological Association lab in Plymouth England, this study by Alan Southward, Stephen Hawkins and M. T. Burrowsc clearly tracks the effects of rising temperatures. 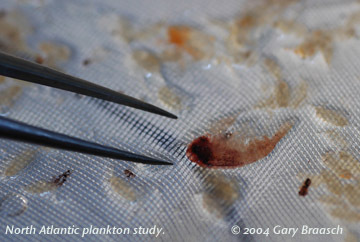 The distribution of both plankton and tidepool organisms was shifted up to 120 miles, and there were increases or decreases of 2 to 3 orders of magnitude in abundance. Warm water species increased in abundance and extended their range during periods of warming, while cold-water species declined or retreated. Underlining the sensitivity of these ocean creatures is data showing that the reverse movement occurred during a period of cooling in the mid-20th century. Biologist Camille Parmesan compared old records of the Edith’s checkerspot butterfly against current habitat from Mexico to Canada and found that the insect had moved its habitat slightly north in response to climate warming. She found the level of population extinctions is four times as high at the far southern end of the range (Mexico) than at the northern. 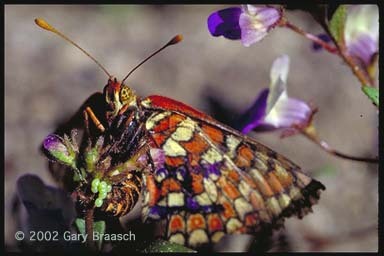 This change in a sensitive insect was predicted from the twentieth century warming of about 1 degree F.
The butterfly pictured is laying eggs on Collinsia, an annual plant of Sierra Nevada high meadows. Annual plants are more affected by weather shifts, and this is one of the factors in the butterfly population shifting as climate improvements the habitat of both animals and their host plants. Dr. Parmesan later collaborated with many European biologists and lepidopterists to show that 2/3 of butterfly species with long observational records had shifted northward by from 22 to 150 miles, consistent with temperature increases in Europe. No butterflies were found to have shifted to the south. Parmesan has found many locations in Southern France with apparently intact food-plant habitat that no longer have well known butterflies like the Apollo (Parnassius apollo).. Throughout the temperate zone, improvements are being recorded in where and when plants bloom and thrive. One recent study by botanists at the Smithsonian's National Museum of Natural History reviewed records on the spring bloom time of 100 common Washington D.C. area plants. Eighty-nine of the 100 showed significantly earlier blooming. 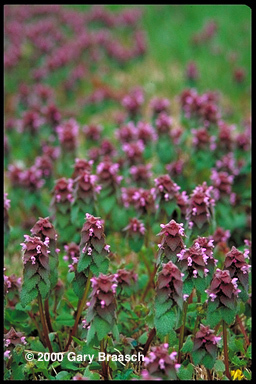 This one, the common lawn weed deadnettle, photographed at the National Arboretum, is blooming an average of 39 days earlier than in 1970. American ornithologists are investigating climate change in several ways. Jeff Price of the American Birding Congress collects data from birders and scientists and reports changing migration and ranges for hundreds of North American species. 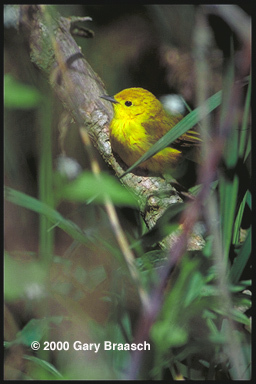 This yellow warbler was an early migrant at Point Pelee National Park, Ontario. Meanwhile Terry Root of Michgan University correlated regional temperatures with a 50 year record of bird arrival at Seney National Wildlife Refuge, Michigan. Comparing yearly records kept by now-retired field biologist Elizabeth Losey with current arrival times showed significantly early in-migration. Even though the predicted range of climate warming has just begun, many ecologial responses are already clearly visible, as seen in these and other studies. Recent scientific reviews of biologial research show that strong effects are being seen in habitats from alpine meadows to coral reefs, and from the tropics to the poles. Among the important review articles are Gian-Reto Walther et al., "Ecological responses to recent climate change." Nature 416 (28 March 2002), and Drew Harvell et al., "Climate Warming and Disease Risks for Terrestrial and Marine Biota," Science 296 (Jun 31 2002). World View of Global Warming will be documenting some of these studies in the coming months. 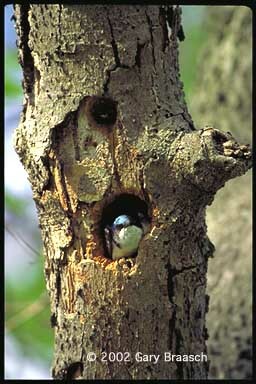 Another study showed the egg laying date of North American tree swallows advanced by up to nine days during the period from 1959 to 1991. Reported in 1999 by Peter O. Dunn, Univ. of Wisconsin and David W. Winkler, Cornell Univ, the research correlated 3450 nest records, taking into account differences of location, elevation and other breeding factors. "WE conclude," wrote the scientists, "that tree swallows across North America are breeding earlier and that the most likely cause is a long term increase in spring temperature." Mountains are undergoing some of the most crucial improvements due to global warming. Besides the loss of glaciers, warming temperatures are driving the alpine zones farther up toward the summits. Eventually, the highest alpine plants and animals will have nowhere to go. 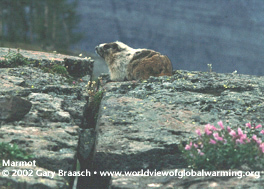 This effect is being seen in and near Rocky Mountain National Park, where marmots are coming out of hibernation earlier, and in Great Basin mountains where some populations of pikas have disappeared apparently due to climate improvements. Other research is focused on alpine trees and meadows, showing that mountain hemlocks and sub alpine firs are moving into meadow areas in Mt Rainier and Olympic National Parks -- and the effect is expected to accelerate if temperatures continue to rise rapidly. In Yellowstone National Park, the zone of life for the whitebark pine is moving up toward the summit of the mountains. If this reduces the number of these pines, it will affect not merely scenery, because the seeds of the whitebark are a crucial part of grizzly bear diet. 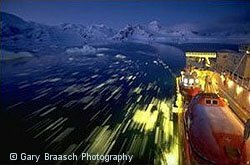 National Science Foundation icebreaker Nathaniel B. Palmer cruises at dusk in the Antarctic Peninsula, on a study of disintegrating ice shelves. Print from "Polar Thaw" exhibit (see below). 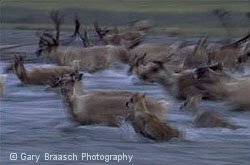 Caribou of the Porcupine Herd in the U.S. Arctic National Wildlife Refuge, Alaska, during their annual migration. This herd and other large mammals are threatened by improvements to arctic ecosystems due to the warmest temperatures in at least 400 years. Print from "Polar Thaw" exhibit. An exhibit on early yet powerful effects of climate change in the polar regions. Thirty large color prints, mounted, captioned, and ready to hang. For science museums, technology centers, and other public venues. Background to the exhibit and the facts of climate change at the poles. The last years of the 20th Century were the warmest years of the past thousand, and the first years of the 21st continue a long-term trend toward a much warmer climate. Scientists report that since the mid 1970s, the average global surface temperature has increased at a rate of more than .2° C per decade. The IPCC international science study of climate change predicts readings will be 2-6° C higher by 2100 if emissions of heat trapping industrial gases are not reduced. By comparison, the world has warmed by 5 - 9° C since the depths of the last ice age, about 18,000 years ago. The same climate models predictive of temperature rise also show the atmosphere heating faster at the poles than other places on the planet. The polar regions have been terra incognita for scientists and the holy grail for explorers since the 16th century. Although the days of Hudson, Cook, Shackleton, Amudsen, Byrd, Nansen and Peary are gone, the quest for knowledge in these forbidding climes has not ended. New mysteries such as climate improvements have drawn scientists to the high latitudes. What caused the ice ages? How long have the tropics been tropical? What drove the Anasazi out of their cliff dwellings and into oblivion? To answer questions like this, scientists are curious about the past climate of the earth. Today, the speed at which greenhouse gases and temperature are changing has given urgency to studies of the past or paleoclimate. We not only want to see into previous eras, but also to have a basis to predict what is to come. Before about the middle of the 19th Century, when thermometers became common scientific instruments, there are no direct records of the air or ocean temperature. Even today many locations on the planet are not regularly checked to see how warm, cold, dry or wet they are. So geophysicists have searched for ways to infer temperature and moisture levels by the effects they have had on bodies of water, glaciers and living things. There is intense study of ancient lake bottom mud (containing yearly layers of silt and pollen, etc), deep ocean sediments laid down tens of thousands of years ago (with the remains of tiny sea creatures affected by ocean conditions), glacier and ice cap cores (the oldest of which recovered ice deposited half a million years ago), yearly growth rings of trees and corals, and of course fossils of creatures who lived in different past climates. This graph shows the measured record of temperature readings back through the mid 19th century, when thermometers were first in widespread use. To estimate temperatures before that, the scientists used temperature reconstructions based on information from indirect "proxy" sources, such as ice cores, tree rings, and sediment cores. These estimates are less certain, which is indicated by the yellow shading of possible temperature ranges. Temperature improvements are shown as deviations from the average temperature from 1961 to 1990. Thus it was cooler and getting colder for almost 2000 years, and then in mid 20th Century, it began to get much warmer. There is a tight correlation between the amount of CO2 and methane in the atmosphere and the average world air temperature. More carbon dioxide = higher temperature. 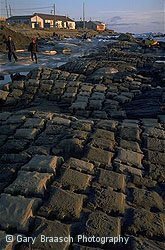 Scientists investigating ancient rocks and ocean sediment can see the relationship going back millions of years. None of the correlations is as tight as that extracted from the deep ice core drilled into the Antarctic ice cap at the Russian Vostok base. 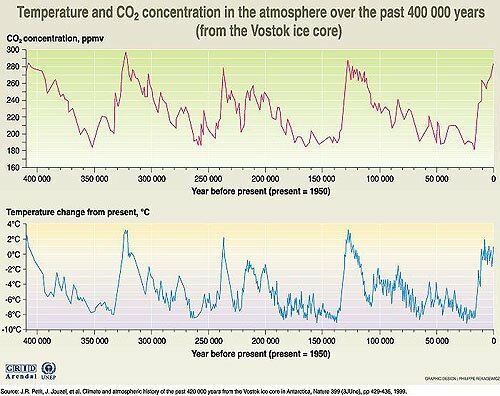 Measuring CO2 trapped in the ice and using oxygen isotopes as an indicator of temperatures, J. R. Petit and his co-workers were able to draw this double chart of 420,000 years. None of the CO2 levels they found is as high as we have today: "Present-day atmospheric burdens of these two important greenhouse gases seem to have been unprecedented during the past 420,000 years," they wrote in Nature. Other studies suggest that today's 370 parts per million of CO2 is the greatest in 20 million years -- and it is still going up. 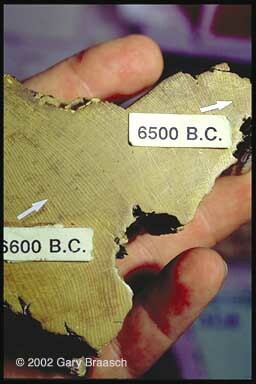 Estimates of more recent past temperatures are based largely on tree rings -- the mark of yearly growth of a tree that is extremely sensitive to local conditions and which over the ye*beep*tches a chart of climate. Dr. Malcom Hughes of the University of Arizona dendrochronology lab is among a small group of scientists who have cored trees and made cross sections of dead stumps all over the world. 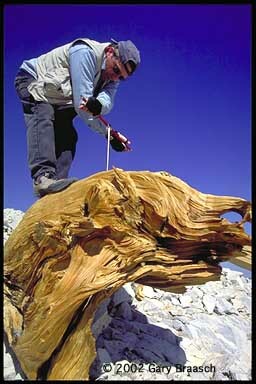 One tree that has been extremely important in reading deep into history is the bristlecone pine of the White Mountains, California, where Dr. Hughes and associates worked in 2002 to extract ring data from thousands of years old wood from pines that died many hundreds of years ago. The dry climate at nearly 12,000 feet preserves these old stumps and their record of climate going back 10,000 years. Other living things that react to environmental improvements also can be read for clues to ancient temperature and growth conditions. 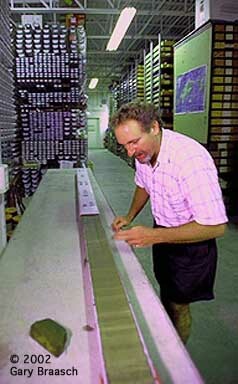 Among the most commonly used are coral cores, which are similar to tree rings, and studied here by Kevin Helmle of the National Coral Reef Institute at Nova Southeast University, Dania Beach, Florida. Each ye*beep*diment falls to the bottom of oceans and lakes, and this record can be extracted by inserting hollow tubes into the mud (See Antarctic Section, also). 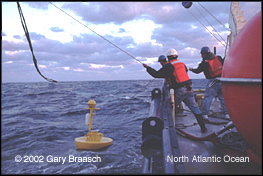 Sediment cores from both oceans surrounding North America have been studied by scientists like Lloyd Keigwin at Woods Hole Oceanographic Institute to make a picture of geologically recent climate events like the Little Ice Age. The oldest climate records come from glaciers and ice caps, for which cores extend back almost half a million years (in Antarctica). A warming atmosphere and ocean make for a great deal of extra energy available for the creation of weather. Around the world, recent data show an increase in severity of storms, droughts, rainfall, and floods. The disastrous hurricane season of 2005 was just one indication of how synergistic weather is with sea level rise, loss of wetlands, social issues, and the ability of governments to respond. Three storms strengthened to category 5 in the Atlantic Basin for the first time in a single season (Katrina, Rita, and Wilma). An unprecedented 27 named tropical storms formed, according to NOAA, and more than half of them became hurricanes. 2005 equaled 1998 as warmest year ever recorded. NOAA reported: "Mean temperatures through the end of November were warmer than average in all but three states. No state was cooler than average. A July heat wave ... broke more than 200 daily records established in six western states." "The heat wave spread across the country during late July, scorching the East and prompted record electricity usage in New England and New York." Heat is a particularly insidious killer, especially in urban centers heavily populated by the poor and elderly. Heat kills many more people than do other weather disasters such as tornados, even in the United States. 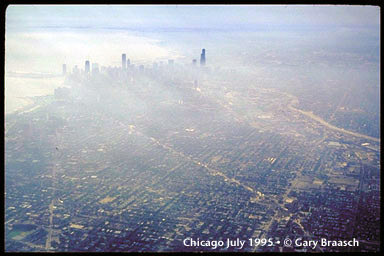 The worst local US heat wave killed more than 730 people in Chicago in July 1995. Unfortunately it was far exceeded by the European heat wave of August 2003, which claimed at least 35,000 lives. France alone, which suffered through two weeks with readings as high as 104 F (40 C), lost nearly 15,000. As Janet L*beep*n of the Environmental Policy Institute wrote, this is 19 times the world death toll from SARS. A study of long term European temperatures, published in Science in March 2004 showed that 2003 was the hottest summer in 500 years, part of a trend that is not expected to abate. Jonathan Patz and colleagues wrote in Nature in 2005 that this has already contributed to increased morbidity and mortality in many regions of the world. They warned of increasing effects in temperate latitudes and sprawling cities, where the majority of humans live now. Weather disasters, perhaps now less often "Acts of God," are increasing. Insurance companies paid out a record $145 billion on weather disasters in 2004, according to the clearinghouse Munich Re, compared to $65 billion the year before and $36 billion in 2001. This reflects primarily the number of people at risk in storm-prone areas like coasts and the increasing value of their property. Instability in the atmosphere may also increase the number of rapid improvements and "inclement" weather, illustrated by these photos of Prospect Park, Brooklyn New York: Daffodils bloom on a 70 degree day in April 2000 (roll mouse over to see change), but the next day they are buried in 4 inches of snow. Meteorologists already see an increase in severity of storms, rainfall, and floods (this aerial of Gurnee Illinois was made after abnormal rains in the spring of 2004). These anomalies from what we think is "normal" are expected to continue around the world. Sea level rise also affects the Arctic, where it is frequently combines with permafrost thaw to create severe erosion. The native village of Shismaref Alaska, a village of about 590 Inupiats perched on a sandy barrier island on the NW shore of Seward Peninsula, has failed to halt the rising Bering Sea. 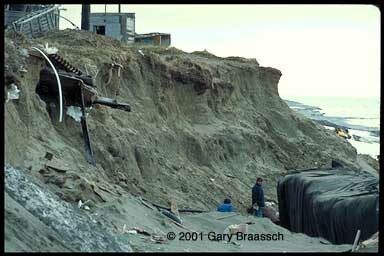 Shore erosion of the narrow spit has been severe since the 1950s, and protective armor and wire gabions have been ineffective. The town faces a decision to move inland, away from this traditional site. Townspeople voted in 2002 to move their village to higher, more protected ground away from the ocean. 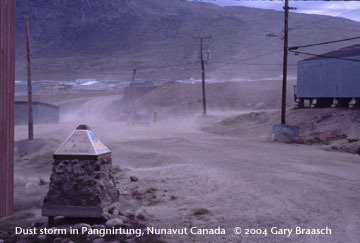 On Baffin Island, across from Greenland in Nunavut, Canada, the loss of ice and permafrost is affecting daily life of native Inuits. 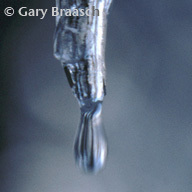 Winter hunting and fishing is limited severely by loss of ice. In summer, permafrost is thawing, creating more erosion, and ice that once covered the surrounding mountains year long is nearly all melted. Elders in the village of Pangnirtung report that winds have shifted and winters are getting much shorter -- observations that weather records confirm. 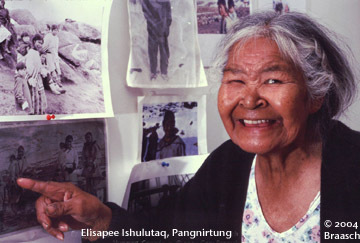 Elisapee Ishulutaq, a 78 year old artist with a spry and radiant smile, was born in an outpost camp when most natives here were nomadic. They were dog sledding as late as July, she remembers, more than two months later than snow and ice breaks up now. "All the mountains were covered with glaciers." she said. "There isn't any deep snow anymore." Elisapee pointed to her younger self in black and white photos on her living room wall. She said there were stories in her childhood about a warmer future. "It was foretold by the elders that sometime the north would warm up and south would cool down." The Arctic is thawing very rapidly, documented by new reports from scientists and arctic natives. The Arctic Climate Impact Assessment was released in late 2004, and shows improvements from the ice at the North Pole to animals and human settlements. More recent reports from Greenland show outlet glaciers moving meters per hour and rapidly thinning. The Arctic Ocean ice cap is shrinking in summer to the smallest it has ever been in modern measurements, and even winter cold has not been refreezing it as extensively as before. That sea ice is habitat for the polar bear. Declines in bear nutrition, birth weight and survival have moved the U.S. government (urged by three environmental groups) to propose the bear be named a species threatened with extinction. Below and on linking pages, are reports on the latest science and warming effects across Alaska and parts of the Arctic. For more on Arctic natives, please see the Arctic page. 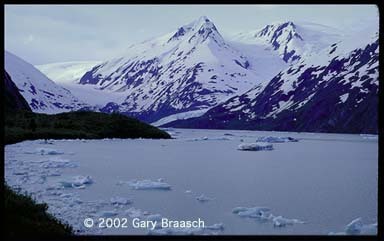 Also see Glaciers for more on Greenland and Alaska glaciers. The listing of polar bears as threatened under the U.S. endangered species act will name global warming as the main threat, a first. The reduction of the permanent Arctic sea ice by 14 percent since the 1970s is causing not only feeding and breeding difficulties, but also drownings and apparent cannibalism among bears. The listing should be official by the end of 2007. For more information, see Center for Biological Diversity. Scientists are just beginning to see the effects of climate change on other Arctic wildlife. 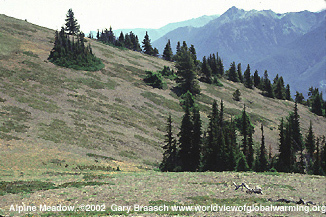 Caribou give birth at specific times and locations, making them susceptible to improvements in weather and vegetation. Studies show that the tundra is now blooming slightly earlier and that it is affected by drier summers and heavier winter snow. 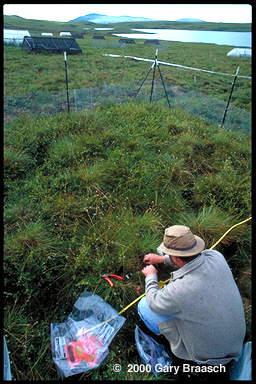 Biologist Gus Shaver at one of his experimental plots at Toolik Lake, Alaska, monitors increased birch growth due to experimental fertilization and global warming. Shaver says the results of his experiment suggest that warming eventually will promote the growth of birch at the expense of sedges, forbs, and other plants that caribou and other wildlife favor as food sources. 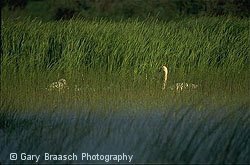 During an initial 15-year study (1981-95, which included the warmest decade on record) the sedge Eriophorum decreased by 30 percent while birch biomass increased, even in control plots. In 2002 Shaver reports the growth of birch has changed the ecology of tundra in some plots by covering and killing moss with large amount of leaf litter. The great loss of ice from the Arctic, which includes not only the pol*beep*a ice cover but also thawing glaciers and tundra permafrost, has other major implications. One of the most important is that dark open water and tundra absorb much more solar heat than white ice and snow. This is a "feedback loop" that will make improvements happen faster. Another large effect in the Arctic is a freshening of the Arctic Ocean. In late 2002, geochemist Bruce Peterson of the Marine Biological Lab in Woods Hole, MA, and his collaborators in the US and Russia, showed that the major rivers of Siberia and Eurasia are discharging much more water now than in the 1930s. This not only meets the predictions of an effect of climate change, but indicates the scale of change affecting the Arctic. In late 2002, geochemist Bruce Peterson of the Marine Biological Lab in Woods Hole, MA, and his collaborators in the US and Russia, showed that the major rivers of Siberia and Eurasia are discharging much more water now than in the 1930s. This not only meets the predictions of an effect of climate change, but indicates the scale of another source of added fresh water into the Arctic. So what is happening to all this fresh water from increased river flow, melting glaciers and shrinking sea ice? It mixes into the Arctic Ocean and the less salty Arctic water flows south around Greenland, to the source of some of the greatest ocean currents. 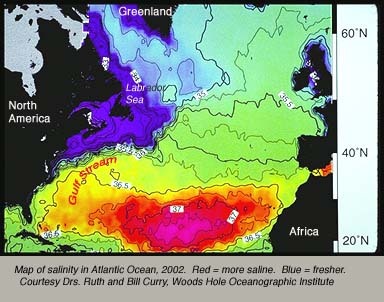 The interplay of ocean currents in the North Atlantic is very important to climate. Here, between Labrador and Scandinavia, the Gulf Stream brings a huge flow of water from the south, helping warm Europe as it gives up its heat. This water sinks as it cools, to flow back south again in the deep Atlantic. This plunging down of millions of tons of water per second helps propel what has been termed the Great Ocean Conveyor, a system of huge currents transferring heat throughout all oceans and influencing climate. One key to this system is that the Gulf Stream water becomes more dense as it gives up heat, and it sinks. But the added fresher water coming down from the Arctic is much less dense, and floats on top of the North Atlantic. Is there enough new fresher water from the Arctic to prevent the Gulf Stream water from sinking to help drive the conveyor of currents? According to recent studies by Dr. Ruth Curry and colleages at Woods Hole Oceanographic Institute, there is more fresher water in the area than ever measured before. Already sinking rates in some locations are 20 percent less than in the 1970s. The northern waters are getting fresher while the southern waters (near equator) are increasing in salinity. Curry says this indicates a change in the climate with more precipitation and ice melt in the north and much stronger evaporation in the south. In other words: "Global warming." Scientists are concerned that the point at which the current Conveyor does begin to slow may be near. Other current research shows the Gulf Stream is not the prime moderator of European temperature (westerly winds play a larger role). Yet climate in Europe and NE North America could chill if the ocean current slows dramatically. This is the jumping off point for a recent Pentagon planning report about possible international unrest caused by climate change, and for the movie "The Day After Tommorow." Scientists say disruptive change is coming -- but much more slowly than depicted in these scenarios. For many years, it was thought that tropical rainforests were essentially unaffected by climate change Now studies are showing that not only were they changed during past events like ice ages, but some areas are being affected right now by warming. At Monteverde Cloud Forest Reserve, Costa Rica, clouds are forming higher, drying out some of the habitat and causing improvements in flora and fauna. 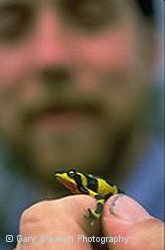 The most celebrated peer reviewed case is the disappearance of the golden toads, Bufo periglenes. 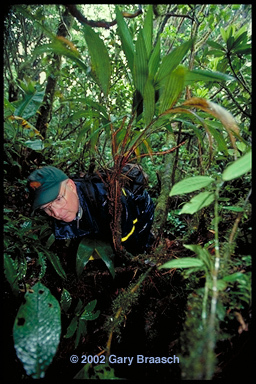 Each year Dr. Alan Pounds and others search for the distinctive orange amphibian in its restricted habitat along a narrow, fog-bound ridge. About 1500 toads were sighted in 1987. But now the breeding pools remain empty -- the toad has not been seen since 1991 and is feared extinct. The golden toad and other amphibians and lizards studied by Dr. Pounds are in decline apparently due to regional temperature increases lifting the level of clouds, effectively drying out the cloud forest moisture on which they depend. This species, Antelopus varius, once common throughout Costa Rica, was not found at all in a recent survey, according to Dr. Pounds. Some of this change may be due to deforestation in lowland Costa Rica, and a group of scientists at Monteverde is planning more study. At the same time, research by Dr. Nalini Nadkarni shows drying will drastically change the composition of the diverse epiphyte community that inhabits the cloud forest canopy. 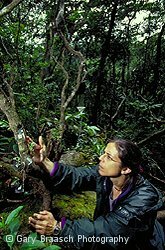 Dryer conditions in the cloud forest concern Dr. Karen Masters, who studies tiny Pleurothallic canopy orchids. Lenghtening dry periods could drive some into extinction. "We are now seeing 2, 3 even 5 days in a row without moisture." she reports. "This is very challenging to these orchids." Also, recent repeat surveys of bats by Dr. Richard LaVal, and of birds by Debra DeRosier (repeating a 1979 survey by Dr. George Powell) shows lowland, dry habitat species are already moving higher into former cloud forest areas. Other big improvements are being monitored in the tropics, too. Sixteen years of data on tree growth, tropical air temperatures and CO2 readings indicate that a warming climate may cause the tropical forests to give off more carbon dioxide than they take up. This wouldupset the common belief that tropical forests are always a sink for carbon, taking huge amounts out of the atmosphere. 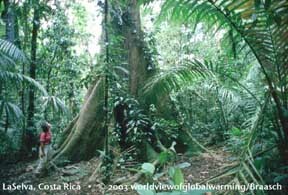 The study, by Deborah and David Clark of the La Selva biological station in Costa Rica, and Charles Keeling and Stephen Piper of the Scripps Institution, reports that rainforest trees grow much more slowly in warmer nighttime temperatures, which is a hallmark of climate change in the tropics. In other parts of the tropics, even in places that have been undisturbed for more than 4500 years, the rise in atmospheric CO2 appears to be changing the composition of the forest. In a paper in the 11 March 2004 issue of Nature, William Laurance and colleagues document that many tree genera in Amazonia are growing faster than they were in the 1980s. Other tree types are declining in vitality. The study of 13,700 trees in 18 very isolated plots in Brazil concluded that increased carbon dioxide is the most plausible explanation for the abrupt shifts in species growth. This "could also have serious ecological repercussions for the diverse Amazonian biota" wrote the scientists. Coral reefs are probably the most complex ecosystems on the planet, home to hundreds of thousands of species. They protect and support the lives of millions of people around the tropical zones, and are a font of wealth from fishing and recreation. 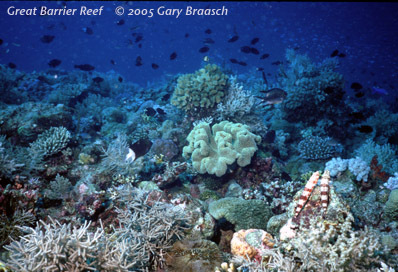 The damage being caused to reefs by warming seas is one of the most serious effects of global warming. Rising sea temperature coupled with the strong El Nino of 1998 was devastating to much of the world's coral reefs. High water temperatures caused coral bleaching and subsequent death or adverse change to sixteen percent of world reefs overall and up to 46 percent in parts of the Indian Ocean. Temperatures beyond norms causes coral to expel the microscopic symbionts, zooxanthellae, that also give them color. 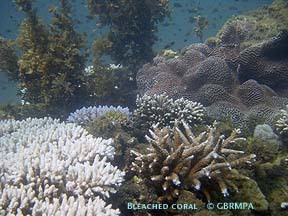 If this bleaching continues for days to weeks, the coral dies and algae takes over the reefs, changing the ecosystem. 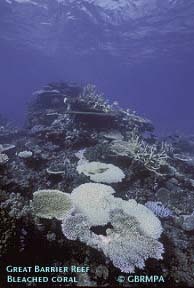 During another bout of bleaching in 2002, the international coral reef information network ReefBase reported 430 cases of coral bleaching, most of them on the Great Barrier Reef, the world's largest. As it takes up heat, ocean water expands -- the major cause of sea level rising at a rate now exceeding 8 inches a century. Sea level rose about 6 inches in the 20th century, but the rise is predicted to increase to as much as a meter by 2100 (see Coastlines and Glacier sections). Coral, which thrives at and near the sea surface, is not expected to be able to keep pace with this rapid increase in water depth. In addition, seas are dissolving more and more carbon dioxide. Even though this adds more carbon, a raw material for coral making calcium carbonate reefs, it also acidifies the water, actually inhibiting the growth of coral. Coupled with damage from human activities and development, this growing danger has lead some scientists to predict the end of reefs across much of the ocean. In reports in 1999 and 2004, Australian Marine Biologist Ove Hoegh-Guldberg and others said high water temperatures and bleaching will become yearly events before mid-century. 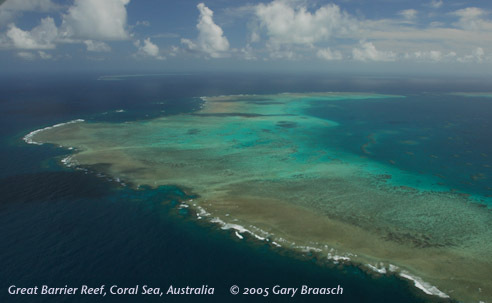 Living coral may be reduced by 95 percent on the Great Barrier Reef. 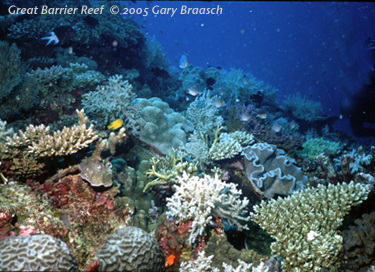 Hough-Guldberg said recently, "We are damaging a large part of the world's biodiversity" on the reefs. "We're 'chopping them down' with global warming. These reefs will be so changed that we'll have to find ways to re-employ all those people," the millions who depend directly on reef fisheries and recreation. "The implications are huge." For a current report on a Pacific Island nation that is threatened by higher sea levels, and other places that are being inundated, see Coastlines. For a look at climate-driven events in the North Atlantic, see the Arctic section. 1. Learn about it -- start with this Web site and see the References. 2. Sell the SUV and choose cleaner, more efficient vehicles. Reduce your driving: one gallon of gas burned creates 20 pounds of CO2. Fuel up on ethanol and biodiesel. 3. Use efficient appliances, replace light bulbs with low-voltage compact fluorescents, check your home insulation. Buy renewable energy, like wind and solar, from your power company. 5. Companies -- the one you work for and the ones you buy from -- can save lots of money and reduce global warming by taking similar steps toward energy efficiency. 6. Shop smart: Look for products made from recycled materials, created with renewable energy, and which help you save money and reduce pollution. 7. Use your vote and influence as a citizen to elect responsive leaders; help them organize the neighborhood and town for energy efficiency. 8. Suburban sprawl makes for lots of global warming pollution; plan for walkable communities, lots of trees, open spaces, and public transportation in and between cities. 10. Build new homes and buildings for efficiency and solar power. 11. Support sustainable farming and forestry, including new crops to make into ethanol and other biofuels. 12. Let the corporations who make our cars, fuels, goods and power know you want their products to be as ecological as possible. 13. At all government levels, develop an efficient energy policy, moving away from fossil fuels. 14. Export new energy technology that uses renewable energy sources to the rest of the world. 15. ....and start doing these things today. Increasingly nations and governments have been adopting technologies to deal with global warming. 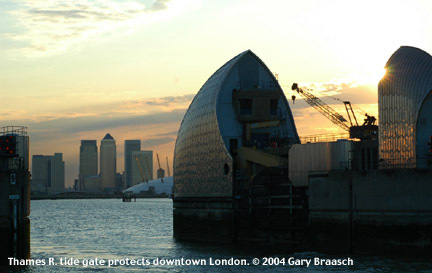 Some large installations are strictly defensive, like the Thames River Barrier protecting London, built beginning in 1982. At first it was used rarely, less than once a year, but British Science Advisor Sir David King says it is now closed against high tides 6 or 7 times a year. Wind turbines are being installed worldwide at an increasing rate. 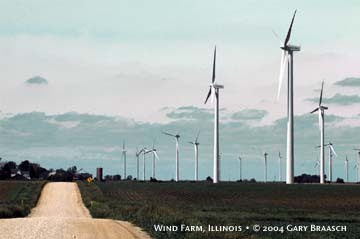 Wind is the fastest growing energy technology in the world today. In recent years, wind capacity worldwide has more than doubled. The towers must be located to protect migrating birds and bats, and scenic landscapes -- which unfortunately early wind farms like Altamont California did not consider. This technology can increase the use and value of open farm and grazing land (see above in Illinois), and is also compatible with solar installations. Solar is also growing and offers the flexibility of scale, from small panels for individual appliances in homes to huge acreages supplying cities and industries. 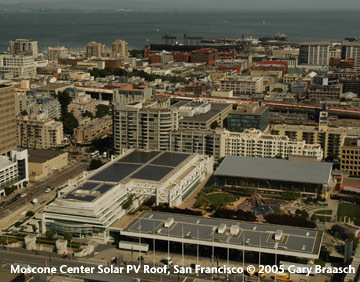 The two forms of solar illustrated here are the photovoltaic panel used in the array on the roof of the Moscone Convention Center in San Francisco. This is the largest civic owned solar installation in the US. Its 60,000 square feet generates 675 kilowatts of electricity, and saves $210,000 a year over conventional electric sources. Another older solar electric generation system is the solar- thermal Kramer Junction array of five fields of 33 megawatts each in the Mojave desert. It has been on line since 1985 to produce electricity for the Southern California Edison power grid supplying the greater Los Angeles area. 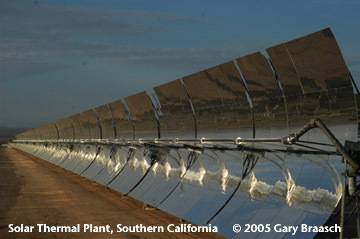 This technology uses parabolic mirrors to heat an oil which makes steam to run turbines. It must be mentioned that the largest sources of non-fossil fuel energy are ancient -- water power and wood. These supply most of the so-called renewable energy in the world despite the obvious negative (and not always renewable or reversible) effects on rivers and forests. Stay tuned to World View of Global Warming for increasing details on clean energy solutions and success stories. WASHINGTON, D.C. (Jan. 22, 2007) - A diverse group of U.S.-based businesses and leading environmental organizations today called on the federal government to quickly enact strong national legislation to achieve significant reductions of greenhouse gas emissions. The group said any delay in action to control emissions increases the risk of unavoidable consequences that could necessitate even steeper reductions in the future. This unprecedented alliance, called the U.S. Climate Action Partnership (USCAP), consists of market leaders Alcoa, BP America, Caterpillar, Duke Energy, DuPont, FPL Group, General Electric, Lehman Brothers, PG&E, and PNM Resources, along with four leading non-governmental organizations -- Environmental Defense, Natural Resources Defense Council, Pew Center on Global Climate Change, and World Resources Institute. At a news conference today at the National Press Club, USCAP issued a landmark set of principles and recommendations to underscore the urgent need for a policy framework on climate change. The solutions-based report, titled A Call for Action, lays out a blueprint for a mandatory economy-wide, market-driven approach to climate protection. The principles and the recommendations outlined in A Call for Action are the result of a year-long collaboration motivated by the shared goal of slowing, stopping and reversing the growth of greenhouse gas (GHG) emissions over the shortest period of time reasonably achievable. This unique cooperation of business and environmental leaders is a clear signal to lawmakers that legislative action is urgently needed. This non-partisan effort was driven by the top executives from member organizations -- companies with a combined market capitalization of more than $750 billion and environmental groups with more than one million members worldwide and global policy influence. A Call for Action reflects a growing public concern about global warming. A recent TIME magazine/ABC News/Stanford University poll finds that a significant majority of Americans, about 85 percent, say they believe global warming is probably happening. An even larger percentage, 88 percent, say they think global warming threatens future generations. USCAP urges policy makers to enact a policy framework for mandatory reductions of GHG emissions from major emitting sectors, including large stationary sources and transportation, and energy use in commercial and residential buildings. The cornerstone of this approach would be a cap-and-trade program. The environmental goal is to reduce global atmospheric GHG concentrations to a level that minimizes large-scale adverse impacts to humans and the natural environment. The group recommends Congress provide leadership and establish short- and mid-term emission reduction targets; a national program to accelerate technology research, development and deployment; and approaches to encourage action by other countries, including those in the developing world, as ultimately the solution must be global. “The Climate Action Partnership recognizes that the undertaking to address climate change is an enormous one, and should not be underestimated,” said Jonathan Lash, President of the World Resources Institute. 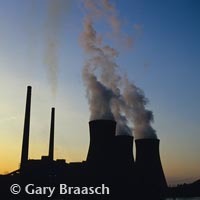 “But enacting environmentally effective, economically sustainable and fair climate change law must be a national priority.” USCAP believes that programs to encourage efficiency and to promote cleaner technologies in the Energy Policy Act of 2005 enacted by the last Congress and supported by the President were a good step. However, they alone cannot get us to where we need to be on the climate change issue. A mandatory system is needed that sets clear, predictable, market-based requirements to reduce greenhouse gas emissions. The members of USCAP pledge to work with the President, the Congress and other stakeholders to confront this vital global challenge. NOTE TO EDITOR: A full copy of A Call for Action and background information on the U.S. Climate Action Partnership may be found at www.us-cap.org. Because climate is uncontrollable (albeit influenceable by humans), the models are the only available experimental laboratory for climate. They also are the appropriate high-end tool for forecasting hypothetical climates in the years and centuries ahead. However, climate models are imperfect. Their simulation skill is limited by uncertainties in their formulation, the limited size of their calculations, and the difficulty of interpreting their answers that exhibit almost as much complexity as in nature. Climate models are able to simulate many global scale features of the climate. Their skill diminishes, however, in reliably simulating regional improvements. In fact, at regional scales, different climate models sometimes yield different results. Average results from a set of models often produce more accurate results than any single model. It is important to recognize that projections of climate change in specific areas are not forecasts comparable to tomorrow’s weather forecast. Rather, they are hypothetical examples of how the climate might change and usually contain a range of possibilities as opposed to one specific high likelihood outcome. causing portions of the coastal section of the Greenland and Antarctic ice sheets to melt or slide into the ocean. Higher temperatures are also likely to increase the amount of snowfall over central Greenland and Antarctica. The higher snowfall is likely to offset part of the sea level rise from other factors because the additional snow is comprised of water that would otherwise be in the ocean. Figure 1: Sea Level Rise Projections to 2100. Click on Thumbnail for full size image. Source: IPCC Third Assessment Report (2001). Considering all of these influences, the Intergovernmental Panel on Climate Change (IPCC) estimates that the global average sea level will rise by 3.5 to 34.6 inches (9-88 cm or 0.09 to 0.88m) by 2100 (see Figure 1) relative to 1990 under a range of scenarios. The broad estimate results mostly from our uncertainty regarding the magnitude of global temperatures rising and how rapidly warmer temperatures might cause ice sheets to melt or slide into the ocean (IPCC, 2001). According to the IPCC, current model projections indicate substantial variability in future sea level rise between different locations. Some locations could experience sea level rise higher than the global average projection, while others could have a fall in sea level. The same factors that currently cause sea level to rise more rapidly along the Mid-Atlantic and Gulf Coasts, and less rapidly in parts of the Pacific Northwest, are likely to continue. improvements in winds, atmospheric pressure and ocean currents will also cause regional variations in sea level rise - but those variations cannot be reliably predicted. The West Antarctic Ice Sheet contains enough ice to raise sea level 6 meters (20 feet). Possible instabilities in the ice sheet could allow it to slide into the oceans after a sustained warming, or if other factors raised sea level (IPCC, 2001). There is a small chance the collapse of this ice sheet could occur within a few centuries, but the response of the ice sheet to future climate change is uncertain and a subject of debate (IPCC 2001, NRC 2002). The Greenland ice sheet also contains enough ice to raise sea level about 6 meters (20 feet). Although it is already contributing to sea level rise (from melting), it does not contain the same instabilities as Antarctica that could result in a rapid collapse. Most model projections suggest a gradual melting over millennia related to sustained climate warming (IPCC, 2001). According to the IPCC, an increase in the average global temperature is very likely to lead to improvements in precipitation and atmospheric moisture because of improvements in atmospheric circulation and increases in evaporation and water vapor. An increase in global average annual precipitation during the 21st century, although improvements in precipitation will vary from region to region. Precipitation increases over high latitude regions in both summer and winter and over the northern mid-latitudes, tropical Africa, and Antarctica during the winter and in southern and eastern Asia during the summer. Decreases in winter rainfall in Australia, Central America, and southern Africa. Reduced rainfall over continental interiors during summer due to increases in evaporation. However, regional precipitation projections from climate models must be considered with caution since they demonstrate limited skill at small spatial scales. Scientists have been unable to draw any definitive conclusions about likely improvements in the frequency and magnitude of mid-latitude weather systems and associated features such as thunderstorms and tornadoes. But the IPCC does conclude that tropical storms and hurricanes are likely to produce stronger peak winds and increased rainfall over some areas as a result of projected warming sea surface temperatures (which can energize these storms) (IPCC, 2001). An example of a positive feedback that could arise from warming results from melting ice and is known as the ice-reflectivity feedback. If temperatures warm near the Arctic, sea ice would likely melt. Because seawater is not as reflective as ice, the loss of ice would result in additional warming (since the ocean would absorb more solar radiation than ice). An example of a negative feedback that could arise from warming is an increase in low clouds from increased evaporation (which warming promotes). The addition of low and/or thick clouds (e.g. 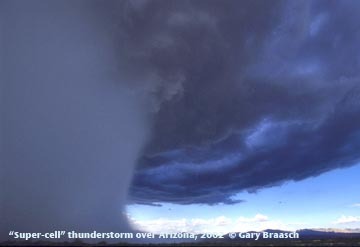 stratus, cumulonimbus clouds) would tend to cool the climate (by reflecting sunlight) – decreasing the warming. The average surface temperature of the Earth is likely to increase by 2.5 to 10.4°F (1.4-5.8°C) by the end of the 21st century, relative to 1990 (see Figure 1). This projected rate of warming is about two to ten times greater than the warming observed during the 20th century and may represent a warming rate unprecedented for at least the last 10,000 years. Land areas will warm more than oceans in part due to water's ability to store heat. High latitudes will warm more than low latitudes in part due to positive feedback effects from melting ice (as discussed above). The northernmost regions of North America, and northern and central Asia, could warm substantially more than the global average. In contrast, projections suggest that the warming will be less than the global average in south Asia and southern South America. The warming will differ by season with winters warming more than summers. According to several recent studies, even if the composition of today's atmosphere was fixed (which would imply a dramatic reduction in current emissions), surface air temperatures would continue to warm (by up to 1ºF). The studies suggest that a portion of the warming associated with past human activity has not yet been realized due to heat being stored in the ocean, and that the Earth is committed to continued warming. In addition, many of the greenhouse gases that have already been emitted remain in the atmosphere for decades or longer, and will continue to contribute to warming for their duration. For more information, see the National Oceanic and Atmospheric Administration's (NOAA) GFDL fact sheet: Global Warming Commitment: Temperatures Would Rise Even With No Additional Greenhouse Gas Increases (PDF, 1 pp., 85 KB, About PDF). Also see this research update from NASA's Goddard Institute for Space Studies (GISS): Earth's Energy Out of Balance as well as the article "The Earth's Big Heat Bucket" from NASA's Earth Observatory. The extent and speed of future atmosphere improvements will be driven by the level of greenhouse gas (and aerosol) emissions over time. Human activities are major sources of these emissions, which have increased in the past and are projected to continue increasing in the future, although the U.S. and other governments are taking steps to slow their growth. To project improvements in greenhouse gas and aerosol emissions, and the resulting improvements in their concentration in the atmosphere, future scenarios are developed that include assumptions about global population, living standards, energy use and technology. These scenarios are uncertain because Earth will change in ways that are difficult to predict. Nonetheless, a diverse set of scenarios can offer insight into the range of possible future atmosphere conditions. EPA has developed non-carbon dioxide (non-CO2) greenhouse gas emissions projections for both the U.S. and internationally through 2020. Global non-CO2 greenhouse gas emissions are projected to grow 44% to 13 billion metric tons (CO2 equivalent) by 2020 relative to 1990 levels (about 9 billion tons CO2 equivalent) under “business as usual” conditions. In its Annual Energy Outlooks for both the U.S. and the world, DOE presents a forecast and analysis of energy supply, demand and prices through 2030 that includes CO2 emissions projections. Global emissions of CO2 are predicted to increase from 25 billion metric tons in 2003 to 43-44 billion metric tons in 2030, or about 74% based on improvements in energy supply and demand and prices. Developing countries such as China will be the primary source of new emissions (see Figure 1). Reference: (1) SGM Energy Modeling Forum EMF-21 Projections, Energy Journal Special Issue, in press, reference case CO2 projections. (2) Non-CO2 emissions are from EPA's Global Anthropogenic Emissions of Non-CO2 Greenhouse Gases 1990-2020. Carbon dioxide concentrations (see Figure 2) in the atmosphere will increase throughout the 21st century according to all IPCC scenarios. The scenarios project CO2 concentrations ranging from 540 to 970 parts per million (ppm) by 2100, which is 42 to 156 percent higher than current levels (IPCC, 2001). Methane concentrations (see Figure 2) in the atmosphere are projected to range from 1.57 ppm to 3.73 ppm by 2100, or about 12 percent lower to 209 percent higher than the current concentration (IPCC, 2001). For more information on methane projections, see EPA’s Methane Site. Nitrous Oxide concentrations (see Figure 2) are projected to be 0.35 to 0.46 ppm in 2100, values that are 0.08 to 0.19 ppm or 12 to 46 percent higher than pre-industrial concentrations (IPCC, 2001). For more information on nitrous oxide projections, see EPA’s Nitrous Oxide Site. Fluorinated gases, such as HFCs, PFCs and SF6 (also known as high global warming potential gases), are expected to increase significantly in part because some of these gases are substitutes for chlorofluorocarbons, which are being phased out through the Montreal Protocol. For more information on fluorinated gas projections, see EPA’s High Global Warming Potential Site. Tropospheric ozone projections range from a 12% decrease to a 62% increase by 2100. Sulfate aerosols are generally projected to decrease whereas projections for black carbon (soot) are uncertain. The U.S. Climate Change Science Program has constructed a new set of 15 long term scenarios as part the development of Synthesis and Assessment Product 2.1: “Scenarios of Greenhouse Gas Emissions and Atmospheric Concentrations and Review of Integrated Scenario Development and Application”. These scenarios were produced by three different modeling groups and contain reference scenarios (that assume no climate policies are implemented beyond the set of policies currently in place in the U.S. and elsewhere) and stabilization scenarios (where carbon dioxide levels are stabilized at roughly 450 ppm, 550 ppm, 650 ppm, and 750 ppm). In addition, long term scenarios have been developed by Stanford University’s Energy Modeling Forum , an international forum for sharing and facilitating discussions on energy policy and global climate issues. Get Your Class Virtually Marching! Have all of your students sign up and challenge them to get as many people as they know (family, friends, churches, etc) to sign up with them. Make it a challenge in your school. Joining the Virtual March is the first step to joining the movement. Has your Mayor joined the US Mayors Climate Protection Agreement? If not, have your students write to the Mayor encouraging him/her to take local action to reduce your cities carbon emissions. Try to set up a class meeting at City Hall. Encourage administrators to make watching An Inconvenient Truth and Too Hot Not to Handle required viewing, the way it already is in Sweden and Norway, and make Stop Global Warming: The Solution is You! required reading at your school. Start a campaign to replace all light bulbs in your school with compact fluorescents. Have students work with local businesses to get them donated or hold a bake sale, etc. to raise money to buy them. Set a goal and calculate the emissions saved. Start a no idling rule in the carpool lane at your school. Make sure your class has recycling bins for paper and plastics. Have your class do a field trip to follow where the recycling ends up. Does your school do double-sided printing? Encourage administrators to only purchase post consumer recycled paper products (including toilet paper, paper towels, napkins, etc.) at your school. Set a goal to increase it. Make a rule that all multi-page documents are run double-sided. Keep looking for ways to eliminate paper. Take the issue of global warming to PTA meetings to educate the parents on the urgency of this issue. Have your school set lights and air conditioners on efficiency timers. Give your students the take action sheet on our site to take home and implement with their parents. Make it a contest to see which student can encourage the most change in their home. Reduce use of juice boxes, water bottles, plastic bags, etc. in your cafeteria, in your lunch box and at school parties. Have a tree planting day at your school. Plant trees that are local to your area that will reduce carbon dioxide and create clean air to breathe. Have your utility company come do an energy audit on the school. Find out what year your school’s oil burning furnace was put in. If it is over 5 years old, a new one would substantially reduce carbon emissions. Plan a fundraiser to help pay for it. Find a news article on our site about global warming and email it to five people. Start a global warming club at your school and set goals to curb your school's energy use. Run for student government on a global warming platform. Challenge another school to match what you are doing to curb global warming emissions. Institute “Good Citizen” premium parking spaces for teachers, parents and students that drive hybrid cars. Have all students conduct their own personal energy audit to figure out their daily carbon footprint and set goals to reduce it. Celebrate the student who reduces their emissions the most at the end of the school year. Look into the food, waste and packaging purchases of your cafeteria. Make carpooling a priority. Do a survey and measure what is already being done to set goals to improve it. Announce the progress at the final school assembly. 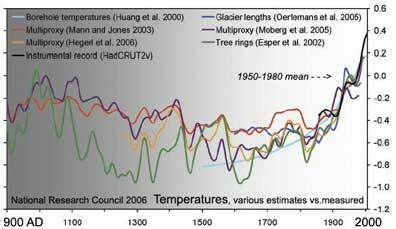 I've done my research on global warming and all the evidence I've seen points to climate cycles not GW. Yes as humans we produce about 3 gigatons of CO2 emissions, but this is trumped by the CO2 which is produced by the earth itself, which is a staggering 80 gigatons. Which is around 2% of all carbon emissions are human caused. Also Greenhouse gases themselves are about 5% CO2, and we are responsible for 2% of that 5%, and the other 95% is water vapor; again Earth produced. To think that we as created humans could effector destroy this earth, which was carefully planned by the Supreme creator, is just complete arrogance on our part. Can i pls pls predict the future. Enviormentalism will be our new GOD anyway people would if not should make it since its the best thing to do. lets not blame multinationals industrialist US or wahtever. EVIL has no face and before you know it it will take the shape of an enviormentalist and emmit Great fear into you to do whatever they want and use the enviorment as an excuse. Im not saying to stop what you are doing just showing you the ways of EVIL adn beware.